Home > Shortage? What shortage? Is there really a dearth of distribution space or is it just speculation? Liza Helps investigates. The latest research suggests there is now a shortage of good modern distribution space in almost every region bar South Yorkshire and the West Midlands, but instead of predictions of speculative development, pundits are saying rents are going to be rising, incentives will be down and occupiers will have to look to build-to-suit to ensure they get the space they need. In those days rents rose, lease lengths were long and developers didn’t build anything that wasn’t institutionally acceptable despite the fact that it didn’t necessarily give occupiers what they wanted let alone needed. But how dire is the problem? “At the end of March 2011,” says King Sturge’s Industrial & Distribution Floorspace Today Report, “available new speculative supply across Britain stood at 12.87 million sq ft in 57 units of 100,000 sq ft and over, compared with 18.79 million sq ft in 87 units at the end of March 2010. At the end of March 2011 the supply of large new distribution facilities was, therefore, 31 per cent lower in floorspace terms than 12 months earlier. Available supply was also around 56 per cent lower than its peak of 29 million sq ft in March 2008. Lambert Smith Hampton’s National Industrial & Distribution Report accounts for the decrease in supply: “Take-up in industrial and logistics units over 100,000 sq ft rose 46 per cent in 2010 to 30.4 million sq ft, compared to 2009. This increase in activity can be partially attributed to retail and internet retailer occupiers reorganising operation networks to drive value out of the supply chain. Occupier demand for new space strengthened and accounted for 28 per cent of total take-up. Looking at the Midlands, Richard Meering of CBRE points out: “The supply of existing units in the East Midlands has more than halved in the last two years and now stands around 1.5 million sq ft; around half a year’s supply. The take-up in the West Midlands has not been quite as strong but there is a definite expectation of further manufacturing requirements. While those statistics are of concern in light of the fact that there has been no speculative development of any significance since 2009, there are those who question whether the take-up boom will continue. The report continues: “The strong rebound in occupier demand in 2010 was largely motivated by demand held back during the global financial crisis due to the uncertain economic outlook and companies being forced to cut costs. However, the demand that was held back has, to a certain extent, been satisfied in 2010. Indeed this certainly seems to be the case. In its latest research King Sturge reports that in the first quarter of 2011, a total of 1.74 million sq ft was taken-up in four new units of 100,000 sq ft and over across Great Britain. This compares with 4.77 million sq ft taken-up in the fourth quarter of 2010 and 4.43 million sq ft during the third quarter of 2010. Scotland saw the largest deal of the quarter with Amazon taking 1,000,000 sq ft in Dunfermline. This transaction accounted for 58 per cent of total take-up in the first quarter. The South East continued to see activity with two transactions, respectively involving Harrods buying Gazeley’s 255,825 sq ft G.Park Thames Valley building in Thatcham, Berkshire on exceedingly good terms and First Line taking 120,000 sq ft in Banbury. Jon Sleeman of King Sturge says: “The first quarter of 2011 saw a more subdued level of take-up involving new units of 100,000 sq ft and over compared with any quarter of last year, suggesting a relatively quiet start to the market this year after a strong rebound in demand in 2010. Nigel Godfrey of developer Gazeley says: “At the moment there is an increasing shortage of available standing stock. A lot of the speculatively built product over the last few years has been taken up. All of the units we have remaining are being looked at [with some under offer] and at present there is no speculative stock being built to replenish those units that have already gone. Richard Lawrence of Colliers International agrees: “Signs are starting to emerge that tenants are running out of options. When once they would have had a choice of two or three buildings, in some cases it’s now down to one, or even none. 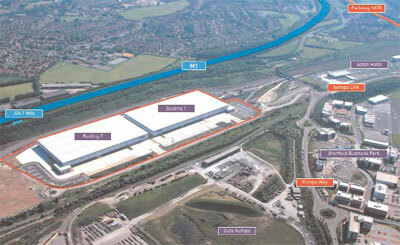 A case in point is the former Biffa building at ProLogis Park Midpoint. The 237,000 sq ft shed, which was never occupied, is rumoured to be under offer to K+N Drinks Logistics on a short-term lease. Letting agent is BNP Paribas Real Estate. A minimum of ten years is likely to become the new norm. What’s more, there will be a wait of 12-18 months for their shed to come out of the ground, taking into account agreeing a specification, negotiation, completing legal documentation and build. For some occupiers, typically 3PLs which have tended to take on leases for the duration of their contracts, typically three to five years, this is going to be tough. Lawrence says he thinks the principals the likes of Tesco, Co-op and Asda will be forced to take on the head lease to secure space for the required decade. One such example is in Wellingborough, where House of Fraser has taken a ten-year lease on a 275,000 sq ft second-hand premises to ensure the implementation of its dot.com offering which has been contracted to DHL. “Quite where this leaves occupiers without their kind of covenant strength is anybody’s guess,” says Lawrence. The recession also meant that land values took a slide. That’s no longer the case. Developers and speculators have seen the way the market is going so demand is improving. As this accelerates, land prices will escalate. Occupiers, ultimately, will pick up the tab. To date, it has been a buyer’s market. The economic gloom has worked in tenants’ favour. As a result, landlords have been prepared to take a hit on rental income; leases have been on the short side as little as two or three years and incentives such as rent-free periods have been generous. But the pendulum is starting to swing. For developers, terms are starting to become appraisal driven. So, in addition to longer leases, higher rents and lower rent-free periods are the only way a deal will stack up. However, it’s not wholly bad news for occupiers. For example, there’s continuing room for negotiation in the second-hand market. In off-pitch locations there are bargains to be had and tenants still have the upper hand. According to statistics there has never been so much second-hand space available. Lambert Smith Hampton says there is some 372 million sq ft on the market. And good quality second-hand space is being let on extremely good terms. For 3PLs there are advantages in opting for second-hand space says Mark Fitzpatrick of GVA. “There is a huge amount of second-hand units ready to go in terms of racking and sprinklers which means occupiers could move very fast indeed.” Buildings include the former Co-op warehouses in Ross-on-Wye and Rugby. Fitzpatrick continues: “Landlords on vacant existing buildings have fit-out packages in place where they could fit [the buildings] out very, very, quickly.” These include AXA’s Arrow warehouse in Worksop, CBRE Investor’s SIRFT warehouses in Sheffield and Crackerjack in Corby. What options does this leave occupiers? Well the obvious has to be build-to-suit. Mark Coxon of Caxtons says: “The supply of [buildings] has been reducing over the last couple of years resulting in increased pre-let activity. But is there enough land ready to accommodate demand? “Not all developers have the wherewithal to throw money at sites,” warns Mike Price of Knight Frank. Some developers are bucking that trend. Richard Smith of developer Opus Land is forging ahead with infrastructure at Opus Blueprint a 33-acre site which can take a single unit of 475,000 sq ft.
Smith says: “Occupiers are very intelligent nowadays and want specific sheds. B&Q was very specific about its build-to-suit at Gazeley’s G.Park Swindon site. The 800,000 sq ft building has a number of level access doors because B&Q loads and unloads its trucks from the side so a huge number of dock levellers would have been impractical. There are developers who are getting into a competitive position for example DP World at London Gateway, Gazeley at Magna Park Milton Keynes, ProLogis at DIRFT, Goodman at Commercial Park Derby and Redrow at Western Approach in the South West. Key areas where the shortage of supply is likely to be greatest include the East Midlands, Eastern Region, Greater London and the South East.